Now gardeners can bring an exotic flair to their gardens by introducing the color, textures, and fabulous foliage of tropical plants. Not just for hot climates anymore, bromeliads, orchids, bananas, palms, birds of paradise, elephant ears, canna, and more can bring a touch of the tropics to any garden. Gardener’s can choose from more than 150 plants featured in this book, each chosen for the visual impact it adds to any landscape or container garden. Plants are organized by a range of clearly defined zones, making it easy for gardeners to find the plants that will succeed in their landscape. Author Nellie Neal explains how to best use tropical plants both indoors and out. To make this book a universally useful guide, it is organized to explain how to grow tropical plants in a wide range of clearly defined zones. Further, the book illustrates how to best use these plants in landscapes and containers, indoors and out, no matter where you live. It is a practical, user-friendly celebration of tropical plants. -I was hoping for a book that actually dealt with these plants in tropical climate settings. 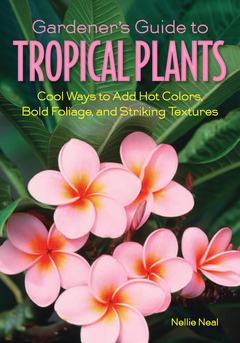 Although this is not that book, it is a very good resource for those wanting to try tropicals in North America. It has good photos of pests that can attack them as well.